Contact us on 01372 722277 for further information or a quotation. System designers faced with a myriad of challenges within the design of heat networks, can be forgiven for labouring under the misapprehension that HIU’s are one-size-fits-all. In fact, nothing could be further from the truth, as recent studies have shown that the performance of HIU’s can have a significant impact on the overall efficiency of a heat network; and therefore, the very carbon and energy cost savings that the network is intended to deliver. The new Building Engineering Services Association (BESA) UK test standard for heat interface units (HIUs) has been introduced as a voluntary scheme, which independently tests the performance of HIU’s under “typical” UK operating conditions. 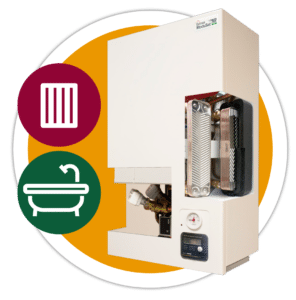 Delivering low return temperatures from the HIU back to the heat network is crucial in driving efficiency and reducing energy wastage, and this new standard provides specifiers and clients with a clear benchmark of how any HIU will perform in heating, hot water and “keep warm” modes over the year. Any unit you specify should have been through this test regime and have its performance results published. (If not, then perhaps ask yourself why not…!). So, ask your manufacturer for details of their published DHW return temperatures (CIBSE Guide recommends below 25℃); what sort of deltaT’s you can expect in heating/hot water and keep warm modes in “typical” UK conditions; and evidence of this through BESA test results. Lowering system temperatures is a critical factor in the efficient operation of heat networks. Heat networks with 70/40 primary flow/return temperatures are becoming commonplace. The ability to provide a quick response to demand for domestic hot water (i.e. when a tap opens) ensures high levels of user comfort and convenience, while also reducing energy and water waste. HIU’s often do this using a so-called “Keep Warm” facility, which is designed to bypass a small amount of warm water through the HIU to ensure that the domestic hot water plate does not become too cool. However, bypassing warm water back to the heat network increases the average return temperature, so this needs to be controlled, which any reputable HIU will, at least do, thermostatically. Better still, market-leading HIU’s are able to provide further control in this area, allowing the Keep Warm function to be operated on a time schedule, helping to save energy by switching the function off and allowing the hot water plate temperature to drop during times it is unlikely to be needed (such as during the working day or in the middle of the night). This reduces the volume of warm water returned to the primary network, helping to maintain a wide DeltaT and high operational efficiency. 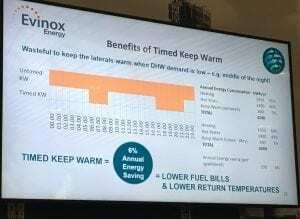 Evinox believes that timing the operation of the keep warm facility to key period of occupation can save around 6% on the annual energy consumption of the network, so it’s crucial to consider your Keep Warm strategy early on in the project! A key differentiator among HIU’s on the market today is the adoption of electronically controlled valves by leading models. The PICV also reduces overall equipment costs and the time required to carry out system commissioning. A historic criticism levelled at HIU’s featuring PICV’s is that they are slow to respond to changes in heat demand and therefore potentially wasteful in terms of energy consumption. But independently produced results from the BESA test standard clearly shows that HIU’s that include the latest fast-acting valve actuators and self-learning control logic to PICV’s, will deliver fast response, close control and low return temperatures. Furthermore, electronically controlled HIU’s provide many additional benefits which are simply not possible without the use of electronic control, including the ability to facilitate a 2‐way communication network, which when connected over the internet to remote servers allows the HIU to become an IoT device, offering a wide range of benefits to both consumers, facilities managers and heat network operators alike. For example, the heating and hot water system in each dwelling can be remotely metered, controlled, interrogated and tested, both during the initial set up/commissioning phase and ongoing operation. Remote access to the HIU also allows domestic hot water and/or space heating set‐points to be altered remotely after the HIU’s have been commissioned, which allows the system operator to maximise the efficiency of the whole system and end user queries to be quickly and effectively resolved without the need for an engineer to attend site. The requirements of the Heat Network (metering and billing) regulations now mean that all end consumers on a district or communal heating network must be billed for their individual heat consumption. 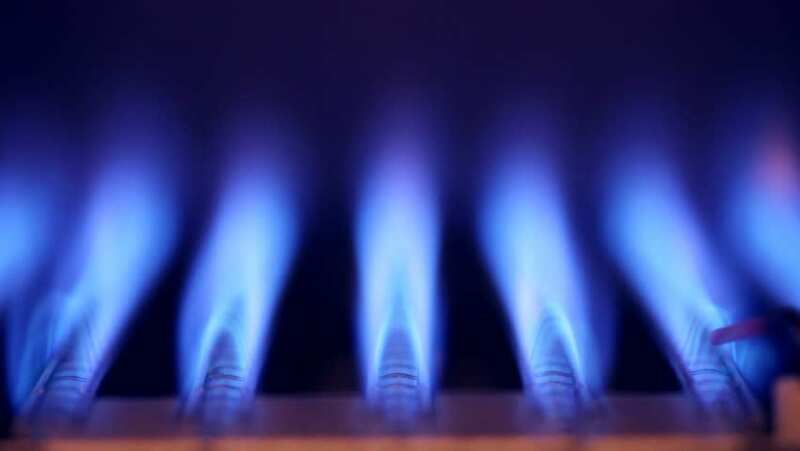 For social landlords (and increasingly in private schemes), pre-payment billing systems are common place and PICV’s offer a further advantage over mechanical HIU’s by acting as the energy shut-off valve and thus allowing automatic disconnection of the heating and hot water when credit has been exhausted. This allows the HIU to be delivered as “pre-payment ready”, removing the requirement to fit an additional external shut‐off valve and avoids the associated cost and installation time. Weather compensation allows secondary heating flow temperatures to be reduced, based on outside temperature. Lowering the secondary flow temperature whilst maintaining a consistent deltaT across the secondary circuit means lower return temperatures to the network can be achieved, helping to optimise overall heat network efficiency and further reduce resident energy bills. Smart, connected control allows outside temperature data to be sent to each HIU, which can then adjust heating flow temperatures accordingly. Operating in this way, only a single outdoor temperature sensor is needed to provide information to the entire building. Smart metering systems are increasingly commonplace, and the ability to display real time and historical heat, power and even water consumption is often demanded by specifiers, either to meet planning regulations or developers added value specifications. 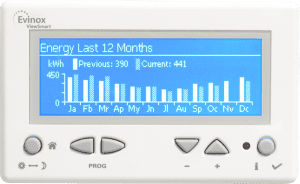 The ability to provide this information direct from the HIU through its own wall mounted display (which also acts as the system programmer and thermostat) is a key attribute where energy display is a requirement, reducing the cost and complexity of providing additional devices, as well as minimising the amount of wall space taken up by various controls and displays. So, I think you will agree that we have seen some serious innovation in heat interface unit design and technology in recent years, and units are certainly not “one size fits all”. Can the units perform efficiently on a low temp network? Are the units Independently tested to the BESA standard with published results? Do the HIUs operate using electronically controlled Pressure Independent Control Valves? And if so, does the HIU employ fast-acting actuators and advanced control logic to deliver fast demand response? Does the HIU have the ability to control the Keep Warm function by temperature and time? What control and communication functionality do the units provide? Are they Metering and Billing Ready without the need for extra equipment? Can they be supplied with HIU compatible Energy display devices? You can find more information on the latest Evinox ModuSat® XR and ModuSat® XR-ECO Heat Interface Units in the product area. Chris Davis – Head of Sales & Marketing at Evinox Energy Ltd.
Evinox welcomes the Chancellors announcement in his spring statement (13th March 2019) that all new homes built from 2025 will be required to be heated by systems free from fossil fuels. 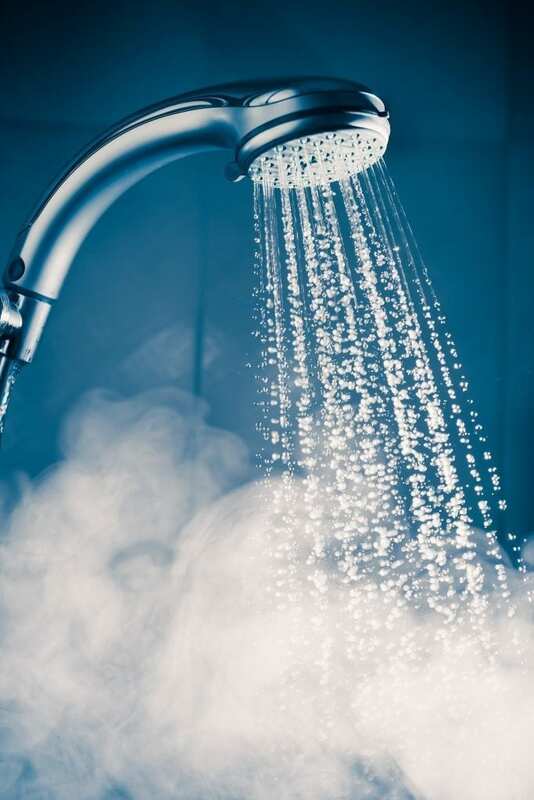 Read our latest blog, which discusses the design trade-offs between hot water response and energy efficiency in heat networks.